This week's video was Snake Oil, a script we've had kicking around for a long time knowing that we needed the perfect location and costumes in order to do it right. Finding the location was time consuming but not difficult. I spent a couple of hours researching and phoning heritage houses and museums in town (something that Victoria has plenty of), and then balking at the hourly rental rate. Locations I turned down politely were Craigdarroch Castle ($800 an hour and we couldn't touch the furniture), and the Royal BC Museum ($2300 an evening, non negotiable). Well ... I tried to sound polite as I choked with shock over the phone. Luckily Carr House was actually affordable, and the caretakers were awesome. They even set out lemonade and maple cookies for us! Location lined up, we then had to find the costumes. Conveniently, we were able to rent everything we needed from a local theatre company that is literally a five minute walk from my house, and about 15 from the moonbase. Graham, Matt and Paul made out well, but unfortunately for me, the best looking dress for the job was about a size too big. Not a deal-breaker by any means, but the dress was both too long in the arms and a little too liberal in the waist to fit well. Luckily it wasn't nearly so apparent when viewed from the side. The only downside to these costume rentals (aside from the cost, which was as much as the location fee) was the washing requirement. The pants had to be dry cleaned at our expense and the shirts and dress were to be hand-washed, which turned out to be my job. The shirts were easy enough but the very large and heavy dress presented a bit of challenge. For a brief second I weighed the option of not washing it, considering I had spent all of 20 minutes in it, but my morals got the better of me and I decided I should wash it as we had agreed to. Good thing I did. The water literally turned brown as I washed the dress. I'm clearly not the only person who rented that dress and was intimidated by the hand-washing process, but apparently I am the only one who decided to wash it anyhow. Yetch. 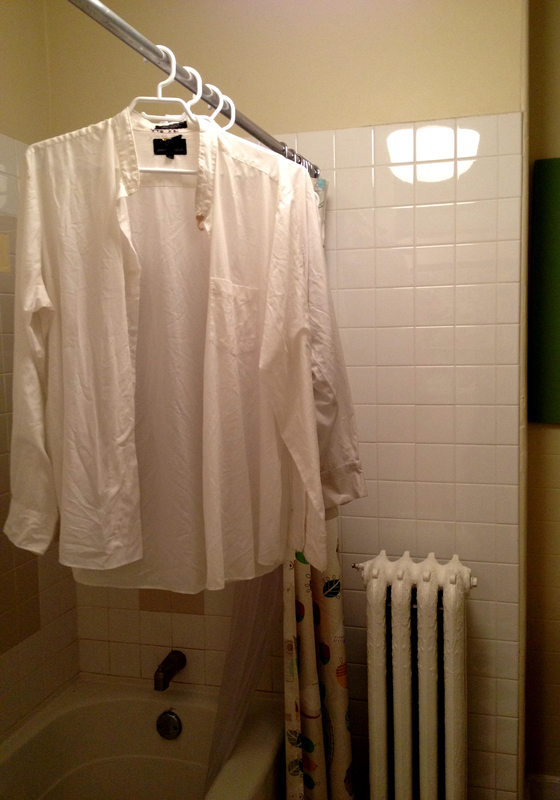 As you can see here, the shirts and dress are currently drip drying over my bathtub so I can fold and return them tomorrow. The exciting life of a sketch comedian! I used Sunlight Cold Water Concentrate to wash the clothes. Thrilling! We forgot to rent Matt pants, so he subbed in some of his own dress pants. Which was completely unnecessary since you never saw either Matt or Paul from the waist down. Next time we're going to save money and just rent shirts and accessories. The "snake oil" was watered down lemonade and the sawdust was actual sawdust from the building supply centre across the street from the LRR Moonbase.